Many will have an anxiety disorder without knowing it. Fortunately, anxiety is treatable and well studied. Caption: The top anxiety disorders in America ranked by the estimate prevalence, or the percent of Americans estimated to have each disorder. 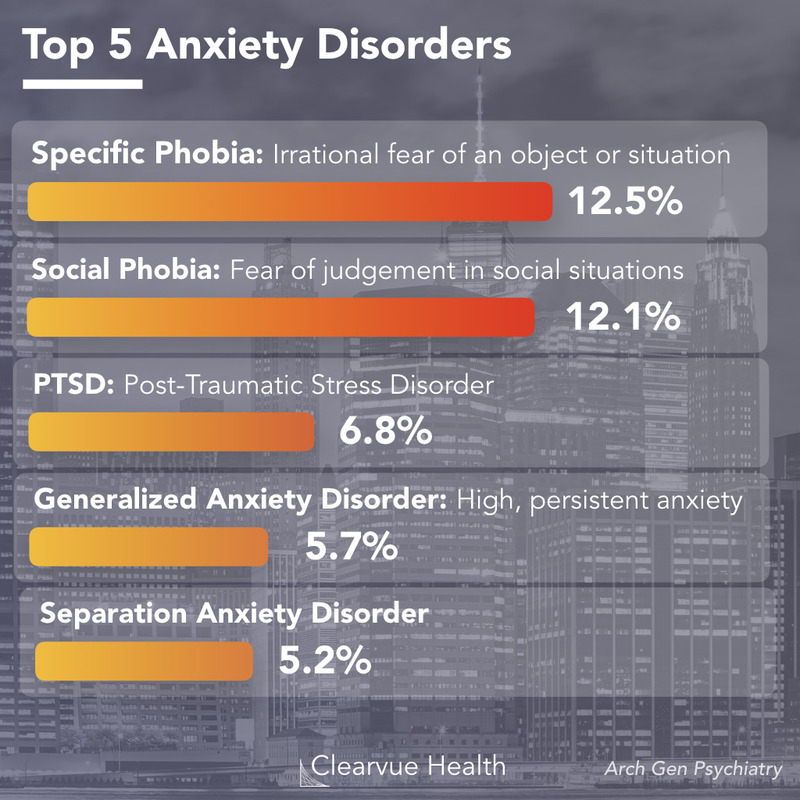 Social Phobias are the most common type of anxiety. These cover specific and irrationally excessive fears of a wide range of situations and objects. Examples include fear of flying, heights, dogs, and needles. Many of these are rational fears. For example, we would all be a little fearful jumping off of a cliff. It’s also wise to be wary of spiders. For these fears to count as a disorder, it needs to get in the way of normal life among other criteria. Social anxiety is a specific fear of social situations, and the potential of being judged or criticized. While we all may have butterflies in our stomachs when giving a big presentation, social phobia is an anxiety strong enough to interfere with one’s ability to normally live life. Patients with social anxiety can often have intense and crippling panic attacks. This is a complex disorder that arises after an individual has experienced or witnessed a traumatic event. It is commonly reported in veterans, but can found in anyone with a history of trauma including but not limited to sexual assault survivors, car accident survivors, and witnesses to trauma. This often takes the form of recurring memories of the event as well as mood changes in the patient. Generalized anxiety disorder is a disorder where patients have an extended period of heightened, uncontrollable anxiety that impairs their ability to live life normally. By definition, this causes medical or behavioral symptoms in the patient such as fatigue or muscle tension. Separation Anxiety Disorder refers to a disorder where one has an excessive fear of losing or leaving someone or something they feel attached to. We all hate seeing loved ones leave, this is entirely normal. This only becomes a disorder when it’s prolonged, gets in the way of life, and becomes symptomatic. Symptoms include nightmares about the issue or emotional distress in anticipation of a separation event.